Comfort eating for Shrove Tuesday. Kept primal. Classic French Cuisine. Kept paleo. Kept simple. Inspired by a wonderful trip to Iceland, Living in the Ice Age went Nordic! Hake is an ugly fish! No wonder the heads are lopped off and the long bodies cut through into steaks. Coming from the same order as Cod and Haddock, hake is a firm white fish but with a more dense muscle structure. It is a real fiddle to skin and remove all the bones, but luckily, it is fantastic steamed, after which the bones and skin just falls off leaving beautiful white pieces of delicately cooked fish. That's the fish, but what to cook it with? Rooting through the freezer, I found a bag of surplus tomato sauce from a recent Cioppino. I have some asparagus and a few salad potatoes and a big bag of spinach. So, stock defrosted in the pan, the fish steamed, potatoes boiled, asparagus cooked through in the tomato sauce and a good mound of spinach softened in butter, we have dinner. Pour the tomato sauce into a bowl, a good mound of spinach placed in the middle, the asparagus around the edge, fish over, potatoes alongside and a little garnish ... we're done ... dinner is served! I picked up a couple of lovely Shetland dressed crabs from my local farm shop. Dressed crab is very nice on its own, the white and brown meats separated and placed into the shell providing a really tasty little bite. It can be de-constructed and made into a really fine starter: Crab Linguine. But linguine is pasta, isn't it? Yes, it is. In Italian, it means "little tongues" ... we can make it out of anything; courgette is perfect, sliced into little tongues with a julienne slicer. Scrape the shell out, collecting the white meat and scraping the brown meat into a dish. Squeeze a generous amount of lemon juice into the brown meat, a little black pepper and just a touch of cream (which is optional), stir together. This will be our sauce for the side. Slice some juliennes of courgette and set aside with the white meat. In preparedness, minced a chilli and some fresh coriander. Asparagus tips, thin cucumber slices and orange segments complete the salad, which can be made up on the plate in advance, cucumber down, brown meat sauce over, asparagus and orange on top, herbs to crown. I also sprinkled some Icelandic ash salt over. In a skillet, soften some of your favourite fat - I used goose fat. Toss in the courgette linguine, which will soften quickly, so be ready to toss in the crab meat, chilli and coriander. One combined, spoon out back into the shell, serving alongside the asparagus and orange side. Tip: a little blob of the brown meat under the shell will stop it skating around on the plate. Occasionally, I eat rice. White rice. Want to know more? Check out The Perfect Health Diet. I do err on the carbier side of paleo and find that a moderate amount of carbs in a dish which is otherwise quite low in fat works out well. What do we have here, then? Some fish and some vegetables: carrot, cabbage, tenderstem broccoli, courgette and aubergine. The fish is coley, a North Atlantic white fish, less flaky than cod. Fillet and skin the fish, laying it on some kitchen foil in a steamer. The foil helps lifting the fish out, which can end up falling apart otherwise. Cut up the vegetables and arrange them in a steamer with the ones that need less cooking towards the top. Place both steamers over a pan of boiling water and let it cook through - this will only take a few short minutes. Push the rice into a ramekin and then invert on the plate for a nice mound shape, arranging the veggies and laying the fish over the top. Garnish. I used some pea shoots and a sprinkle of Icelandic Ash Salt over the fish. I did some cauliflower rice for my Mrs by simply steaming and crushing a few florets. There's a little goat yoghurt, dill and lemon juice mayonnaise, too. My inspiration for this dish was a simple steamed fish lunch at a café in Reykjavik where the 'Fish of the Day' was coupled with pretty much whatever they had ... vegetables and rice; a very welcome lunch. ... some days, just just want something really simple. I got some great looking swordfish from my local fishmonger. Nutritional profile is really good: protein, fat and strongly anti-inflammatory. Swordfish couples well with strong, spiky flavours, so I made up a little salsa from tomatoes, cucumber, spring onions, red onion, dill and red wine vinegar. This was left to sit for about an hour. I also fancied some cabbage, which I steamed and then sat in a pan with goose fat ready to just warm through and "wet up" with more good fat while the steaks cook through. Sit the steaks on for a couple of minutes each side to sear and cook through, laying some asparagus alongside to grill. Warm the cabbage through in the goose fat. Cabbage down first, steaks on top, asparagus alongside, salsa over and garnish: pea shoots in my case. ... a good splash of Tabasco, or similar, over the meat is always good. ... straight copy of my Icelandic Sheep Soup, but with reindeer meat and swede instead of the potato, so perhaps just that little bit more paleo purist-friendly. Begin by browning off some diced meat, add an onion, roughly chopped, some leek, some garlic and top up with stock and herbs: thyme and rosemary. Let it stew for a good couple of hours before adding in cubed swede and carrot to cook through for a further hour. Serve out with salt and black pepper, and a garnish of fresh parsley. Turkey is a lean meat, great for a light meal alongside some good fats from, say, avocado ... I also made just a few fat fries, fried in goose fat. Take a pound of turkey mince. Try really hard not to mess with it, fiddle with it or get it mushed up, but divide into four and gently squeeze each up into a ball. Press the ball flat making a patty around five inches round. Salt over the top. Fire up your griddle pan and grille them. Serve with a simple salad and your favourite sauce alongside. I went with avocado, tomato, some pea shoots and a ramekin of daikon tartar. Daikon tartar? You know ... Tartar Sauce? Peel, cube and boil some daikon. Blend it with some mascarpone and use it for another meal a couple of days ago. Leftovers ... so, squeeze of lemon juice, sea salt, black pepper, finely chopped dill and roughly chopped pickled gherkins. I also made a few fat fries, fried in goose fat. The remainder of the potato went into a Leek & Potato Soup for starters. The leeks were the green tops off a leek used in another meal which you'll see tomorrow: a Nordic Meat Soup of reindeer, swede, carrot and leek. In the kitchen, the tops, tails, ends, trimmings and excess can all be used for simple accompaniments or whole courses, sometimes ... it just takes putting together. This soup, for example, made from the trimmings of two entirely different meals. You can collect up these scraps or just use them on the fly for a soup course or perhaps a little taster in between courses. Imagination and invention ... get your brains working and chase the creative. Actually, pan fried smoked salmon over garlic crushed potatoes with daikon cream, daikon cake and a purée of greens with asparagus and macerated cucumber! We've just had a wonderful little break away to Iceland and I wanted to cook something to round off that trip and remind us of some of the colours and the flavours. I had gorgeous couple of pieces of smoked salmon fillet in, which is perfect as the centre piece of the meal. I also had some daikon that needed using up ... that got me thinking about snow. This is one of those meals that you prepare all the parts of the meal up front and put it all together at the end. Each part also used up all the trimmings and offcuts somehow, so pay attention to each step and don't throw anything away! Peel and slice some cucumber, reserving the skin for another part of the dish: the purée The slices should be thin. Pour over a couple of caps of white wine vinegar and toss in some finely chopped dill having removed the thick stalks. Again, reserve the stalks for the purée. Take a few spears of asparagus and chop the tips off, reserving the stalk for the purée. Boil the tips briefly and add to the macerating vinegar. Chop up a lot of dill really finely. This will be the covering garnish for the fish. Again, remove the thick stalks which should be reserved for the purée. We also need just a little onion flavour, for which a spring onion is perfect. Slice off the white parts, reserving the greens for the purée and drop the white parts into the macerating vinegar. Collect all the green trimmings, chop up well, drop into a pan with a little butter and sauté through before pouring on some water. Some, not a huge amount. We're going to blend, sieve and reduce later, so the more water you add now, the more you'll have to reduce later on. Add a little sea salt in, too. Again, not too much since we'll be reducing and compounding the flavour. After a few minutes of boiling, blend together to a really fine purée and pass through a sieve. Return the liquid to the pan and set to reduce. Daikon has a great radish flavour, perfect for partnering with the soft sweetness of the salmon. Take your daikon, peel it and cut good thick slices straight through. One per person. Trim the edges to make a soft cake. Chop up all the trimmings and the rest of the daikon - this will be the daikon cream. Boil the lot, retrieving the cakes for later. We'll colour these up in butter at the end. Blend the rest of the daikon and add some mascarpone. Cream cheese, creme fraiche, even cream will do fine. My initial idea was to make quenelles and present as a sort of ice cream on top of the daikon cake. You can do this by popping the mixture in the freezer and bringing it out once hardened, forming quenelles at the last minute. I didn't have enough time, so it went on the plate as a second purée. All the faff is now done, so all that is left to do is boil the potatoes and pan fry the salmon, and daikon. Set some salad potatoes boiling and just when they're about done, put the salmon in the hob in a skillet with some melted butter and, in another skillet, butter and the daikon cakes to colour up. Pan fry the salmon on one side for two to three minutes, flip over and same on the other side. After another two or three minutes, remove from the hob and allow the residual heat just to cook it through while you plate up. Your purée should now be fully reduced. Potatoes done, crush them with a fork using the residual heat to melt a little butter in and cook a clove of minced garlic through. Black pepper. Just a grind. Potatoes in the middle, daikon cream one side, green purée the other. Daikon cake on top of the cream, or, if you've done the freezer thing, form quenelles of the cream and gently place on top of the cake. Lay the salmon over the potato. Drain off the cucumber, laying pieces around the plate along with the spring onions. Place the asparagus tips over the green puree and garnish: chopped dill over the salmon, Icelandic ash salt over the daikon. Lovely contrasts, both in colour and flavour. *Now you see it ... snow with ash, green moss and the salmon with a surf of potatoes. ... or am I perhaps a little unhinged? The open sandwich can be found across Europe and Scandinavia, each nation bringing its own variation, but nowhere is it more celebrated than in Denmark where is it practically an institution. The open sandwich, or open-faced sandwich, is a simple slice of bread topped with meat or fish, sometimes pâté, eggs, pickles and salad. Originating perhaps as early as the 6th Century (according to Wiki) but certainly during the Middle Ages, the bread was in place of a plate and the food layed over, the bread eaten at the end. As paleo eaters, we don't eat bread. I could have made up a loaf of nut/seed bread or even just gone for a less problematic slice of rye bread, but it's just as much fun to remove the bread altogether ... we have plates, afterall. While many open-faced sandwiches are quite simple, based around one or two ingredients, I decided to go to the other extreme, to the quite ridiculous and load everything I could think of onto a plate. Actually, I was inspired by such a similar creation that I ate in Stockholm airport only a few days before. So, your open-faced sandwich can be anything you want ... meat or fish, perhaps pâté, eggs, pickles and salad. I went with some nice lettuce at each side of a rectangular plate. Next, some smoked salmon and prawns in stripes. Fill in the gaps with boiled egg, sliced, pickled beetroot, pickled gherkin, tomato, cucumber and pink grapefruit segments! Yes, pink grapefruit, a perfect accompaniment to smoked salmon. Poke a few cubes of chicken liver pâté in and garnish with dill, lots of dill. Kjötsúpa is a traditional Icelandic dish of sheep, onion and root vegetables fortified with brown rice, barley or more traditionally, rolled oats. Reading around the topic, many people claim that the dish must have this ... or must have that ... for authenticity. Many dishes the world over are like that. 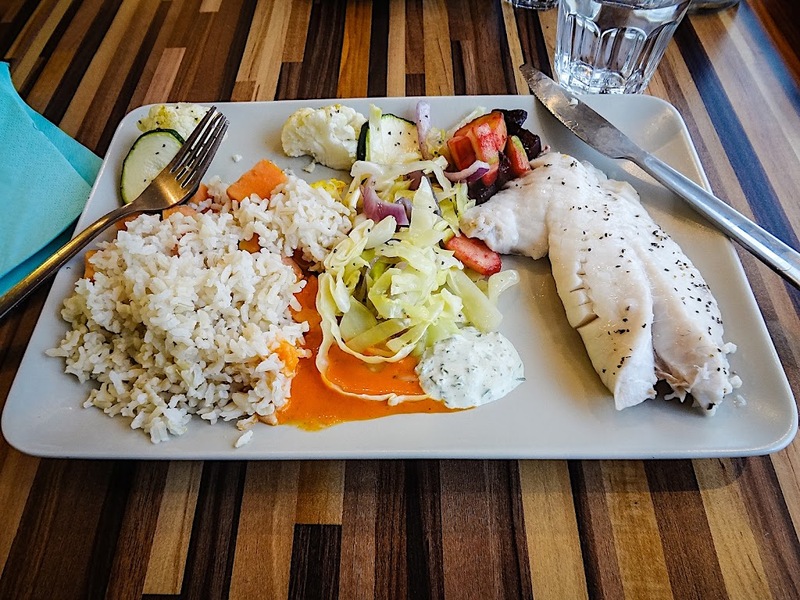 I had some at a simple café in Reykjavik and got all I needed to know about this warming, comforting homely dish. From a paleo perspective, we should leave the grain out. More purist paleo eaters can happily leave the potato out. For a purist paleo Kjötsúpa, begin by browning off some diced lamb, add an onion, roughly chopped, some garlic and top up with stock and herbs: thyme and rosemary. Let it stew for a good couple of hours before adding in cubed swede and carrot to cook through. Serve out with salt and black pepper, and a garnish of fresh parsley. For a paleo+ Kjötsúpa, begin by browning off some diced lamb, add an onion (I went with half an onion and some leek), roughly chopped, some garlic and top up with stock and herbs: thyme and rosemary. Let it stew for a good couple of hours before adding in cubed potato and carrot to cook through. Serve out with salt and black pepper, and a garnish of fresh parsley. Next time, I'll take the inspiration and go with another Nordic meat: reindeer, simmered with swede and carrot. Some Icelanders serve out the meat and roots onto a plate, the cooking liquor accompanying in a mug alongside. If you want to serve out this way, make the cubes of vegetables a little larger at around an inch square. When serving as soup, dice the vegetables a little smaller, say, to half an inch square. Sheep on Iceland outnumber humans by almost 2:1 - there are around half a million sheep on Iceland to around 230,000 people. It is also said that these sheep are the descendants of the original herds brought to the island by the first settlers, a fact that I find amazing. Bouche! Your mouth ... something to tickle your tastebuds. Taking a short break up to Iceland, we ate at a really cool restaurant: Sjávargrillið, whose genius Chef Gústav Axel Gunnlaugsson preceded his quite stunning dishes with a little amuse bouche. His was a very small portion of chopped cucumber, radish, that sort of thing, with a blob of very refined flavour - it might be a root, might be a vegetable, could be an emulsion of herb; whatever his choice that day, it was always superb! My ode to his little creation was to place some very small cubes of cucumber, radish and red pepper into a small dish along with a parsnip cream. Peel, cube and boil some parsnip. Puree the parsnip with some garlic while it is still hot - this will cook the garlic through without cooking out its flavour. Add in some cream to cook it. Blend on until really smooth. Be aware that this little dish is served in a salt saucer - it is that small. For garnish, I used a single coriander leaf and a sprinkle of Icelandic ash salt. ... this was prior to an evening of spicy Mexican inspired food. Make your amuses fit with the meals to come - it should be a microcosm. While in Iceland (the country, not the shop ... before everyone goes en masse down to that frozen food retailer and winds up disappointed), I picked up some black salt. "Icelandic flake salt from the Saltverk Reyjaness in the Icelandic Westfjords has a fantastic crispy crunch, clean mild flavour and good aftertaste. Upon returning to Britain, we went food shopping and I could not resist some really gorgeous looking plump and fresh scallops. ... but, we were having an evening of spicy Mexican-inspired food and it really should tie-in somehow. Easy! Chilies, lime juice and a garnish of coriander. Perfect for the fire! Icelandic salt sprinkled over for the ice. The black, green and white we'd enjoyed some much as the landscape of Iceland. Iceland, Nordic and ... OMG! How good is whale? Apologies ... no, I don't apologise ... I don't apologise for the passion. I've just had a few wonderful days up in Iceland. I am so invigorated, changed, fired up, inspired ... whatever the phrase. I'm into a new approach and I am so excited. Living in the Ice Age just got Nordic ... proper Nordic! Actually, quite Celtic. Hold onto your teeth! There's a Viking punch coming! * Not all of it - it will still be ancestral in focus and paleo for the most part. I won't be extolling the virtues of muesli and rye bread just yet! Watching 'Diners, Drive-ins & Dives' it astounds me just how many really good eateries there are in the States. Granted, they're not perfectly paleo, but they do cook good, real food from scratch and really care about what they make. I am willing to bet I could eat well at any of the places that are features, just skim over the Mac & Cheese and drop the bread ... and we've got something that is actually pretty good. Of course, purists could take issue, but then ... they will. On one particular episode, it went a little more upmarket and our host found himself in what looked like a better kitchen than the run of the mill episode fodder. The Chef (sorry, cannot recall his name or even the restaurant) was a San Fran celebrity, but the sound of it, and took his cuisine very seriously. I've made this before but had no cultural point of reference other than pictures on google. I enjoyed it very much and though then, if I could watch a Chef actually cooking it, I could really get a handle on what the dish is about and make it quite something. The Chef, typically, had all manner of gear, ingredients and skill which we do not ... but we can make a reasonable approximation at home. A-ha! Now we're getting to the heart of the dish! So, a working man's dish, simple sauce and whatever seafood is available. Our Chef went into some detail with the sauce, which involved a staggering array of processes, but was in essence, good tomatoes and seafood stock. I eat a lot of seafood and keep all manner of heads, tails, bones, shells and so on in a box in the freezer until I have enough to boil up a stock. I do this with some onion, celery and carrot. Boil ... boil ... boil ... and then sieve. The stock thickens with the goodness from the bones. If I had one of those industrial kitchen blenders, I'd whizz the lot up and pass it through a sieve for maximum flavour, but I don't ... so a simple sieve, rinse and then reduction has to suffice. The stock is then poured into bags and kept in the freezer until required. You can do this ... or you can buy fish stock from the supermarket. Check the fresh meat and fish aisle first, since you might just find a pot of fresh stock in and amongst. Otherwise, grab some stock cubes, but do check the ingredients since stock can often contain all manner of things that we primal eaters don't really want to eat. I also have some nice tomatoes, which, after cutting an X into the bottom of each, immersing in boiling water for a couple of minutes and pulling off the skins, are ready to dice, toss in goose fat and be introduced to the fish stock along with a damn good squirt of tomato puree. Once the tomatoes are softened, whizz the lot up with a hand blender. Notice the lack of onion and garlic here? It's tomatoes and fish stock - all the flavour is already in the fish stock. Sieve again if you like. I did. Add some chilli, black pepper, sea salt and perhaps some Worcestershire Sauce. This is the most perfect tomato soup if you ever wanted just a straight-up tomato soup. Set to reduce just a touch while you cook through some seafood. I had fish: cod and smoked haddock; and, shellfish: prawns, scallops, squid and mussels. Fish first, then the shellfish. Fold through gently and use the prawns as an indicator as to when things are cooked. The prawns will turn pink. Ready? Spoon out into a wide-brimmed bowl and garnish with parsley. You'll see this as an option on the breakfast menu of many a good British Hotel, but rarely do we (the people) actually eat our famous dishes. Wiki: "... Kipper is a whole herring, a small, oily fish that has been split in butterfly fashion from tail to head along the dorsal ridge, gutted, salted or pickled, and cold smoked over smouldering wood chips, typically oak.". Related, in method, is the Bloater; herring left whole, guts intact, and smoked. Smokeries are becoming more popular in Britain as more small scale producers are emerging. While previously, Kippers were almost exclusively Manx, you'll now find Cumbrian, Northumbian and many Scots smokeries producing kippers. Mine were Northumbrian, from Robsons of Craster. Simple to prepare, just release from any packaging and place under a moderate grill (broiler, to some) for a few minutes until the oils bubble on top. Serve on their own with just a slice of lemon or with some scrambled eggs alongside. Two eggs per person, gently break up the yolks. Don't whisk them to a blended mixture and don't add salt! Gently break the yolks. Warm a pan with a generous helping of butter, but not too hot that it burns the butter, and pour in the egg mixture. Let it sit for a good few seconds before folding the cooked eggs into the wet mixture. Repeat, simply lifting off the stove if the heat gets too much and the eggs are cooking too quickly. The residual heat in the pan will continue to cook the eggs through. Don't be rough with scrambled eggs. Fold them together gently and the dish will be a soft duvet of eggs; whisk and you'll have a hard, unforgiving texture. I like chilli in my eggs, so a shredded chilli was added in during the cooking. Just before the eggs are fully cooked, remove from the heat and using the heat in the pan, just fold the last of the uncooked egg through. Serve out with a grind of freshly milled black pepper and some sea salt crushed over. For a really sumptuous dish, add in a little double cream to the mixture just after it hits the pan. Joy! I have found Yorkshire Kippers! If you want an eyebrow raiser, look into the Festival of Lupericalia, the pagan festival which St Valentine's Day superceded: "Girls and young women would line up on their route to receive lashes from these whips. This was supposed to ensure fertility, prevent sterility in women and ease the pains of childbirth.". Curiously, St Valentine was no patron of lovers (that, itself a Chaucerism) although his martyrdom may have been, in part, for his performing of clandestine marriage ceremonies for soldiers forbidden to marry. Legend has it that on the eve of his execution, he wrote the first Valentine card ... to the daughter of his jailer, signed "from your Valentine". In modern times, a day to declare love, even in secret, and for those of us who have already found true love, a day to celebrate that love together. In the Anglican liturgy, the day is the Feast of Saint Valentine which has the optional rite of renewal of the vows of marriage. Did someone say feast? ... a really nice dinner, maybe. We began with an amuse bouche of cauliflower greens, spinach and smoked garlic. Simply soften an onion, garlic and shredded cauliflower greens in some butter, add stock, ground coriander, black pepper and a couple of generous handfuls of spinach. Boil until everything is soft and then blend. Pass through a sieve, discarding the fibrous waste. Reduce the liquor further, fortifying the flavours. From something like a pint of soup, a couple of espresso cups should be gleaned. Next, smoked salmon and caviar. Smoked salmon is so gorgeous, but it does like to be served with something lighter alongside, for which I made an aubergine and creme fraiche dip. Peel and cube an aubergine, softening it in a skillet with butter. Add a little white pepper, squeeze of lemon juice and a pinch of ground coriander and cumin. Blend together with equal amounts of creme fraiche, dropping into ramekins to cool in the fridge. Serve cold. Crisp lettuce leaves fill in for thins. In all, a good, fatty dish - each bringing its own thing to the party. For mains, sous vide salmon and Hollandaise with roasted roots. Scale, fillet and skin your salmon, selecting two really good fillets for poaching. Place each fillet in an airtight bag and lower into water that has been boiled and allowed to cool for a few minutes. After about half an hour, just put the pan on a very low heat. The heat in the water will gently and slowly cook the salmon through. This is my paleo-sous vide method. Roots? Peel and cut some roots - parsnip and carrot are perfect, and roast them in goose fat. Done. Hollandaise is so simple, I wish it wash not proposed as a cumbersome or daunting task. Simple separate a couple of eggs, yolks into a bowl, whites can be reserved for something else, and whisk the yolks with some lemon juice. Whisk it well, so it becomes light a airy. Melt some butter in a pan. Some? It doesn't need to be exact, but an equal amount of melted butter to the size of the yolks is about right. Over a pan of hot water (the poaching pan, having withdrawn the salmon and set to a boil), hold the yolks over while you slowly pour the butter in, whisking all the time. Carefully done, the milk solids can be left behind. Efficiently done, the Hollandaise will not scramble. If the sauce even begins to look like its turning to scrambled eggs, whip it off the pan and pour in a quick splash of cold water, whisking it in. Return to the heat to firm up again. I use salted butter for this since it does like a little saltiness. I also like herbs in - chives, here. Serve out, salmon taking pride of place, spooning the Hollandaise over and roots alongside. Again, there's a lot of fattiness here, but each bringing their own thing to the party. 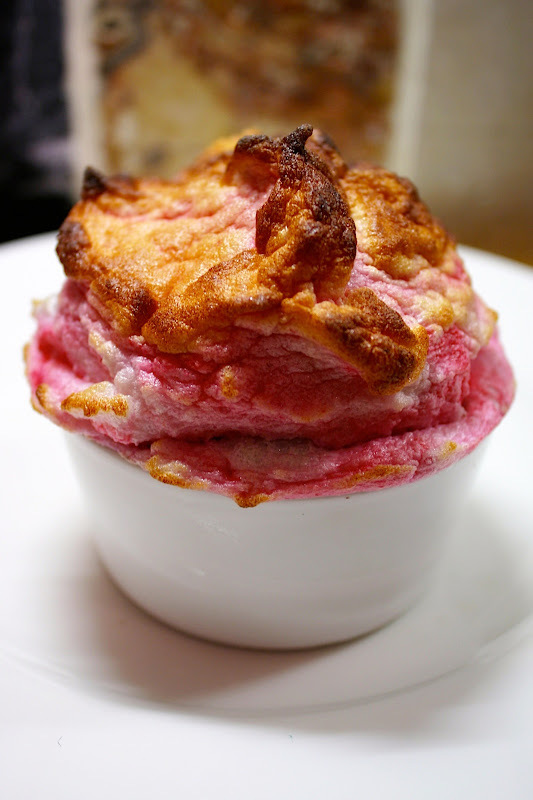 Now for dessert ... Raspberry Soufflé. Prep. The eggs whites from the Hollandaise are happily sitting an a bowl. Two whites here, which will be more than sufficient for two people. One cup of raspberries, blended and passed through a sieve will do as the colour and flavour, and just a little honey. Half a teaspoon. When I started experimenting with this dish, I noted that it lacked a certain something and that is ... sweetness. Ramekins - this will make four, so butter them up and line them with cocoa powder. The powder will help it not to stick and to rise quite uniformly. Whisk the whites until they are soft and velvet-like, and able to form peaks with the whisk. See how the cocoa stops the soufflé from sticking? Bake in the oven at 180C for about ten minutes. Serve quickly, since they do drop - posing for a picture leaves them a little deflated. Of course, at times of celebration, what better than a bottle of pop? Whatever you call it, we just had it and for dinner, we had a treat! From Wikipedia: "Suiza, or Swiss, is an adjective that indicates the dish is topped with a white, milk or cream-based sauce, such as Béchamel. This appellation is derived from Swiss immigrants to Mexico who established dairies to produce cream and cheese." Fusion food - Swiss/Mexican? How cool! We need something for the filling. I made a beef mince and prawn stuffing with cauli rice. Notice we don't need much. No need to go all neolithic and drown this great food in cheese; just a little will do just fine. I used a blend of mature and medium cheddar. Some. I don't measure, so don't know how much, so "some" will have to do as my explanation. Yes, inevitably, some of the filling falls out, so just heap it back up onto the plate. Fantastic flavours, textures and a superb dish! Do you like the dish? That's a neolithic artefact! Mark Sissons has his Two Minute Salad which he eats regularly. I have mine, which I have eaten pretty much every day for the last couple of years and not yet got bored of it, not one bit. Base - any variety of lettuce, shredded, perhaps white cabbage, perhaps red cabbage, perhaps a mix. This is to make up the bulk of the dish, something to chew on and keep the whole thing moist. Very occasionally, salad potatoes might form the base. Protein - any protein will do, be it leftover meat, cooled and shredded, canned fish, flaked fish, shellfish, spicy chicken. This is the good part of the meal. Fat - fatty meats and oily fish are all well and good, but we can always do with a little more fat. An avocado cubed or sliced is always welcome, as it Salad Cream. I am quite happy using Heinz brand since here in the UK, the only offending ingredients are a touch of sugar and the oil - yes, those together make it wholly bad, but it's a condiment. Let's not get stressed, eh? Olive oil and avocado oil made into a vinaigrette to slosh over is another approach I often take. Interest - lettuce, salad cream and protein is all very well, but any dish can always do with some interest. I like pockets of interest around the dish - cubed cucumber, small tomatoes, radish, cubes of good cheese, olives, perhaps capers, pickled gherkin, pickled beetroot, pickled chillies ... the options are abundant. Garnish - garnish with a boiled egg. I don't need to say how good eggs are and all the wonderful micro-nutrients you get from them. Also, herbs and seeds. I have a jar of mixed seeds: flax, pumpkin and sunflower. Just a sprinkle over. Pickled herring over potato and havarti. Prawn with beetroot dyed egg. Have fun and eat well! Who doesn't like Hollandaise? You? Okay, we all love Hollandaise! But, what to do with all those leftover egg whites? We could make up a mega-egg, frying the lot in a large pan and cracking one fresh egg with yolk into the middle. We could make a bacon and egg sandwich, frying just the whites as one large wrap to fold around bacon. We could whisk them up with some sugar and make meringue ... but that's not very primal. We could ... make a soufflé! No flour, no substitute ... No sugar, no substitute! Primal palates are quite happy without sugar and without some sweet substitute. Using good berries, we want to taste good berries - even with tart berries like raspberries there is sufficient sweetness in them. So, is it really going to be this simple? I had three egg whites. I had no idea what ratio of white to berries to go with, so grabbed a cupful - a coffee cup, rather than a measured cup. Blend the berries with a hand blender. Blend them really well. Pass through a sieve and you have a thick jus. Whisk the whites. Whisk them really well until a thick, velvet consistency appears capable of forming peaks as the whisk is withdrawn. Fold the berry jus into the whites and gently turn it through a few times. Spoon the whites into ramekins. Mound them up high for a rustic look or shave them off at the height of the ramekin and run a thumb around the edge of the rim so that they rise uniformly. The three eggs and a cup of berries made four ramekins. Into the over for 7-10 minutes. They will rise, but eat them straight away since they will drop if not dived into immediately. Yes, and no. Yes, it tasted fantastic! 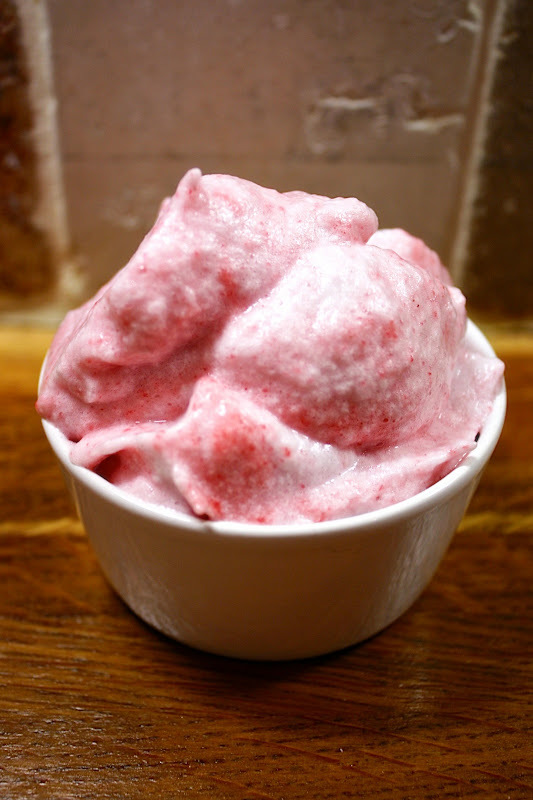 The tartness of the berries was gorgeous folded through soft airy fluff. No, it felt like something was missing - not sugar; it was just a bit ... well, empty? Perhaps that is the nature of soufflé? Mint. Mint with raspberry. I'm sure this will fill in the emptiness and round off the flavours. Pepper. With strawberry. Same thing, just rounding off the flavours. The options are quite literally endless, but as an experiment into making a flourless and sugarless soufflé, I think I succeeded. The next batch will be more professional looking and more rounded. Inspired by the French regional Galette de Sarrasin, or buckwheat crêpe, I set about making my own take using more primal-friendly ingredients. I am not wholly against using buckwheat - it is, afterall, not actually a grain, nor a cereal, but a seed and (according to Wikipedia) curiously related to sorrel, knotweed and rhubarb, and entirely gluten-free. But ... I didn't have any in, so, I used an egg and a banana. Yes, that's it! Per person, one banana and one egg. Peel and break down the banana with a fork. Crack in an egg and keep mashing to a fine paste. It need not be a purée; a few lumps are fine. You could use a food blender, but it's more fun with a fork. Pour the batter into a well greased skillet - I used goose fat, and plenty of it. While the crêpe is cooking, sprinkle over some cumin and coriander; warming spices from the Middle East. Our French cousins over the channel take this simple crêpe and make it into quite a fine dish. Type "galette de sarrasin" into your favourite search engine and hit the 'Images' button for some inspiration. Pork, cheese an egg, perhaps some crème fraîche and smoked salmon, how about some pâté? Fold the corners over, roll, fold in half ... there seems to be no rules here which is great, because I am probably so far from the path now there's little hope in getting back. I went with some really good chicken liver pâté and fried egg, sloshing some chipotle Tabasco over and garnishing with chopped chives. Alongside, tea, like all civilised people ... with a slab of salted goat butter ... like all good uncivilised people! Did it work? Yes, it did ... actually, the mild sweetness in the crêpe coupled with the warmth from the spices worked very well with the subtle sweetness in the liver pâté and the egg just bound everything together. Gorgeous! Certainly one to do again.